There’s nothing better than sharing quality time and quality food with the ones you love at Christmas. But if you’re eating an all vegan diet this time of year can be tough to navigate. 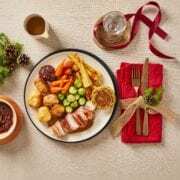 None of us likes to be a bother (especially on Christmas day) and it can be a bit of an emotional minefield declining to partake of your mothers’ famous turkey dinner (“what do you mean you’re not having any? It’s Christmas!”) or your in-laws special trifle (“just have a little bowl”). Likewise, if you’re playing host to vegan friends and family for the first time, deciding what to serve can be a real challenge. Animal-derived ingredients are often present in foods where you really don’t expect to see them. 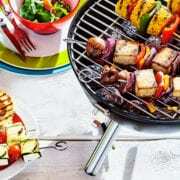 Pesto (includes cheese) and Worcestershire sauce (made with anchovies) are prime examples of this, but there are even some brands of sugar and beer that include animal products. 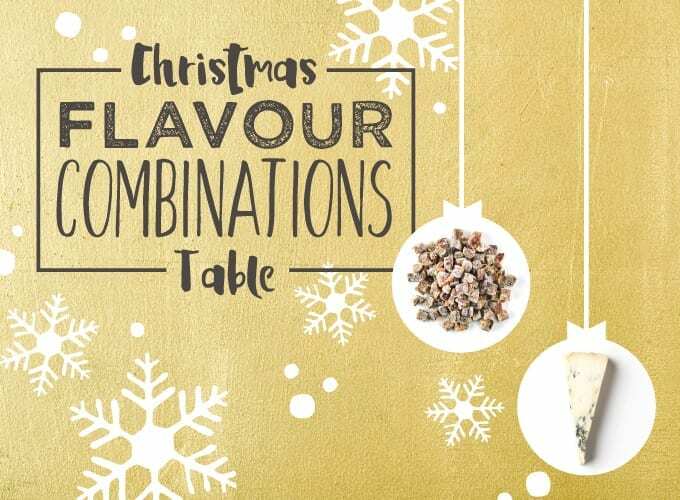 With this in mind, we thought we’d share a few tips to make sure everyone sat around your Christmas table get’s their fill of delicious festive flavours this year! For those that are new to the vegan game, vegan diets are 100% plant-based. And at the risk of stating the painfully obvious, this means only consuming foods made from plants. As you’d imagine, vegetables fall into this category, as do grains, nuts, seeds, legumes and fruits. What it doesn’t include are any foods which come from animals. This means avoiding meat, eggs and all dairy products including cheese, ice cream and most kinds of chocolate (although there are vegan versions of all of these). But many people forget that honey and gelatine (found in candy and sweets) – are also animal products and so they’re also off the table for a vegan diet. Another common trip-me-up around Christmas time is gravy. Depending on your methods (using meat juices is a no-no) your go-to gravy recipe might not be vegan-friendly (keep reading to find our Vegan Gravy recipe!). Some alcohol isn’t vegan either, so check your labels when you’re stocking up to make sure you’ve got bottles to cater for all. We stock a variety of vegan wines in the Gousto Market, which you can add to your box when you check out. Edible homemade gifts speak volumes. Ideas that can’t be found on a shelf show thought, care and preparation, especially for vegans, whose day to day lives are shaped by what they can and can’t eat. Presenting a herbivore friend with an edible gift shows a real effort to get to their hearts and tummies. 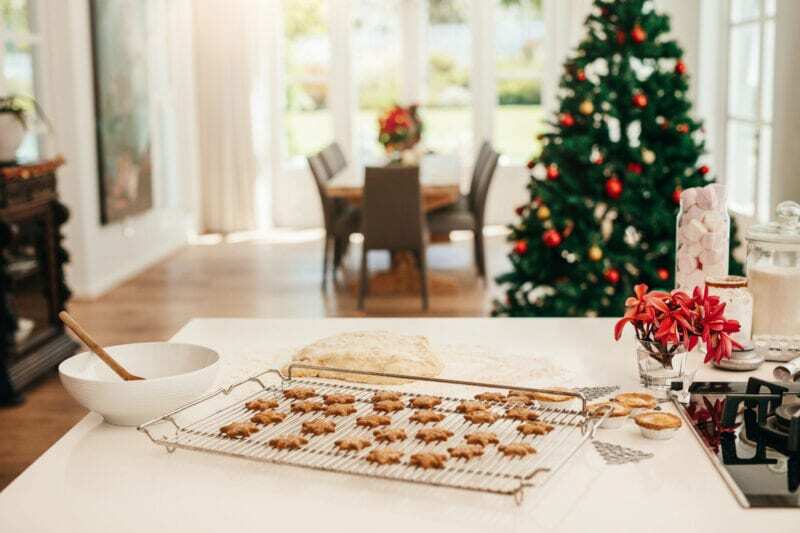 If you’re gifting someone with a sweet tooth, try your hand at making spiced cookies, replacing butter for coconut oil and maple syrup for agave or honey. Whereas a spread of meat can be laid out for carnivores and vegetarians can always enjoy a cheeky cheese plate, vegans must be more selective. But there’s still plenty of scope for experimentation when it comes to nibbles for a vegan crowd. Dips like hummus, guacamole and salsa with tortilla chips and vegetable sticks are easy to make and can be enjoyed by all. A nutty nibble, candied in maple syrup and baked with cinnamon and cumin are a perfect festive finger licker. They’re easy to put together, go perfectly with festive drinks and will impress any vegan guests. Check out our recipe for tasty savoury Pumpkin Seeds in the video below! Side dishes can be where vegans can come home to roost, as plenty of plant-based meals are made from delicious dinnertime accompaniments. 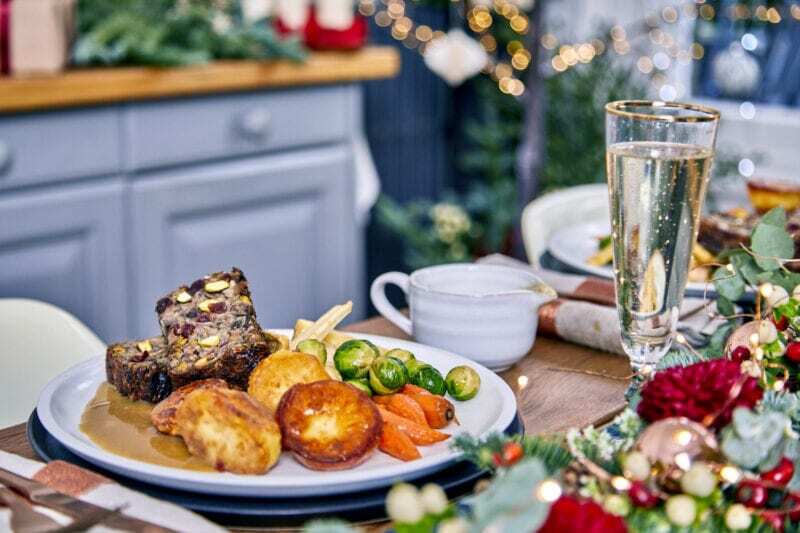 Gousto’s Christmas range comes with some glorious sides this year. 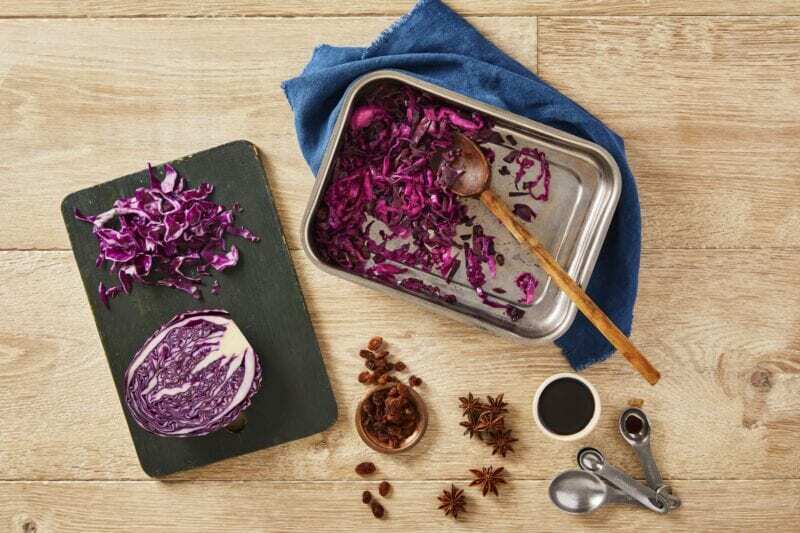 From Balsamic Roasted Sprouts to Potato & Parsnip Gratin, we’ve taken popular festive ingredients and given them a special twist, meaning there’s plenty of inspiration available for plant-based dieters. For a main meal that brings together flavours of the season, while incorporating a hero of the vegan diet, our Christmas Cauliflower & Candied Pecan dish is an inventive centrepiece, whether you’re vegan or just you fancy a change from meat-heavy December dishes. You’ll roast cauliflower until golden and serve it with creamy mash, made with free-from mayo. Finish it with candied pecans and drizzle of salsa verde. 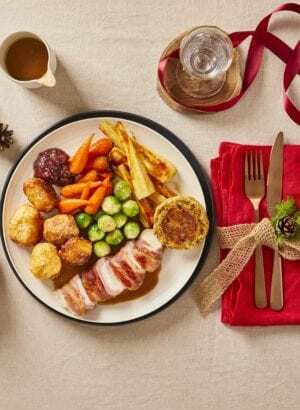 No hearty Christmas comfort food is complete without a generous dollop of gravy. 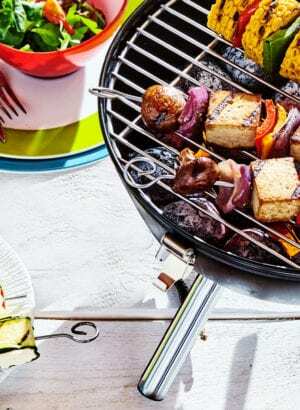 But many recipes rely on butter and meat juices for flavour. Luckily we’ve got the perfect vegan recipe! Heat pan with coconut oil over a medium heat with 1 tsp flour. Cook for 1-2 min, stirring frequently until you’re left with a sandy paste. Gradually stir in 200ml boiled water, soy sauce and Henderson’s Relish. Cook for 4 min or until the gravy has thickened. Add sugar to taste and season with a very generous grind of black pepper! Line a and grease an ovenproof pudding bowl with oil. Sift the self-raising flour, baking powder and salt in to a large bowl. Add the cinnamon and allspice. Mix well. In a jug mix together the treacle, stout and rum. Pour into the bowl with the flour and whisk together. Stir in the orange zest, apple, almonds, currants, mixed peel and mincemeat. Pour the mixture into the lined bowl. Place the bowl on a baking tray and surround with 2 cm of boiling water. Bake in the oven for 50 min to 1 hour or until the puddings are springy and firm. Remove from the bowl. Allow to cool and either serve or store in an airtight container. 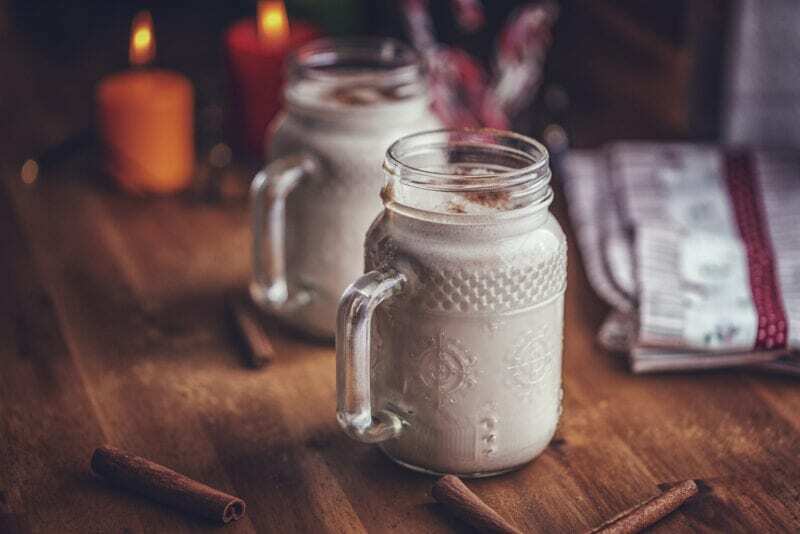 We all love to drain our festive desserts with cream, and switching your classic dairy with a cashew version is easy, delicious and great for vegans. Just soak 150g of cashew nuts overnight. Drain them, then blend with 150ml of water (or more depending on what consistency you like). Add vanilla paste and a little icing sugar for the perfect dairy free accompaniment to your pud. Bring to the bubble and taste – you might fancy a bit more spice. Stir in the alcohol, and serve in a mug! 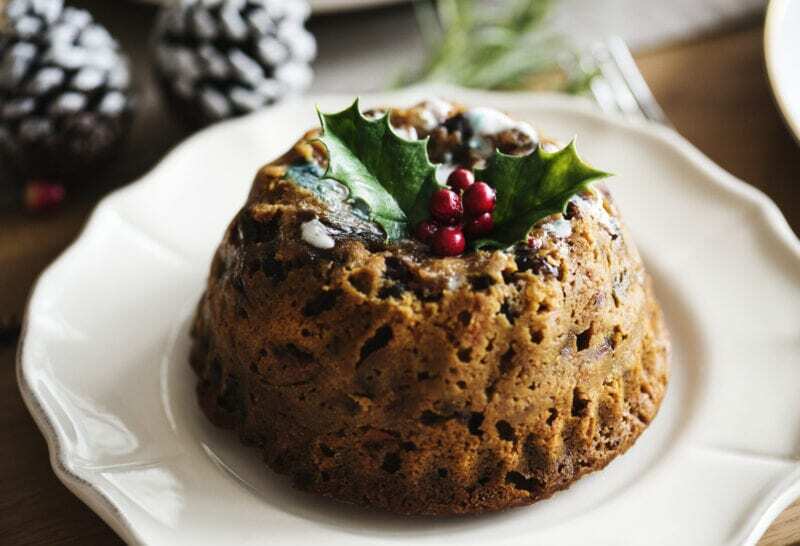 It can feel tempting to slip into full force with Christmas flavours – spice here, winter berries there. And why not? If there’s one time a year to go all out, now’s the time. But, don’t forget what works and is popular. All year classics like meze boards filled with Mediterranean flavours like olives, hummus, and soft, warm bread can be the happiest and fastest way to please both vegans and meat-eaters alike. If you’re hosting a vegan friend, family member or work colleague this holiday season don’t be afraid to ask them if they have any ideas they’d like to bring to the table. Chances are, they’ll have a few cracking recipes you might never have heard of that they’d be delighted to share with you. 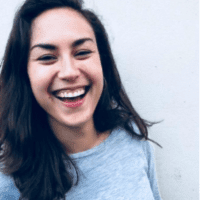 It’s also possible that they have a slightly flexible approach to their diet and are happy to make a few exceptions to the plant-based rule. 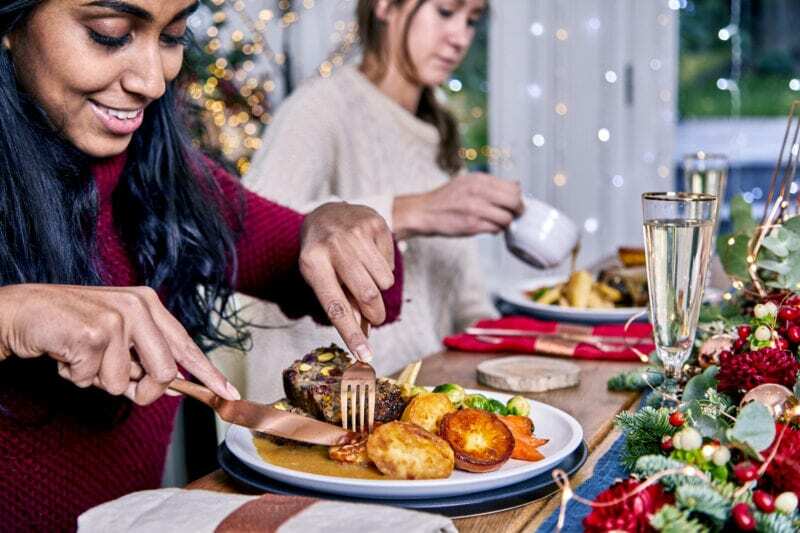 Equally, if you’re eating a vegan diet and you’re a guest around someone else’s table this Christmas (or if you’re heading out to an office Christmas party) make sure to flag this to whoever’s in charge of food well in advance. No one wants to get stuck with a plateful of plain sprouts on Christmas day. Tip 12: Give it a go! If Christmas is a time for sharing, might you find yourself inspired to give plant-based dieting a go? 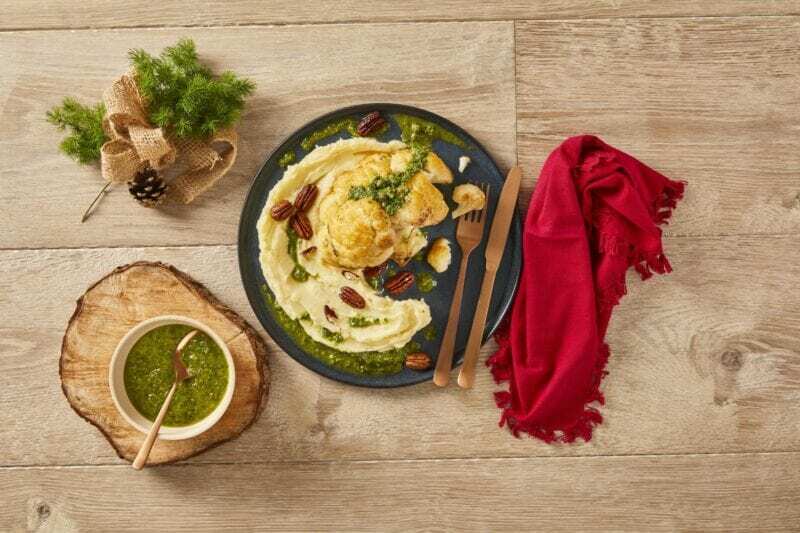 Whether it’s one meal a week, or a dinner party where you can serve one of our vegan inspired dishes, let 2019 be a year of branching out with your dishes! 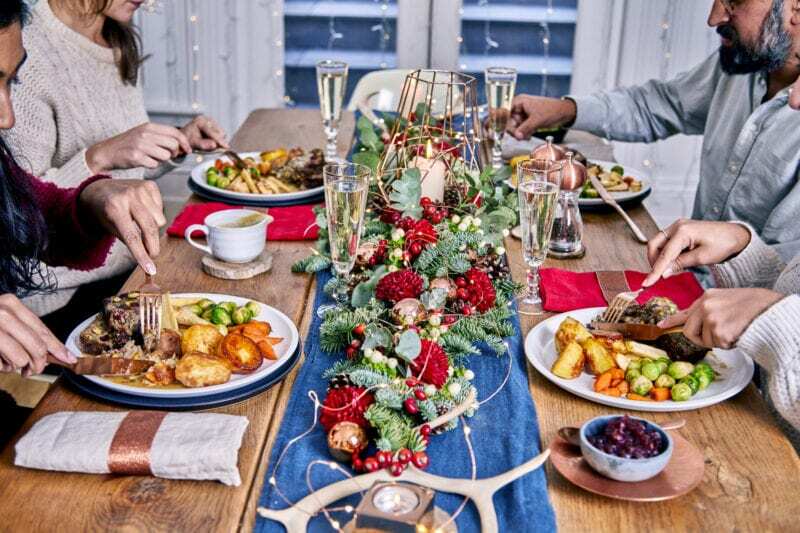 We hope we’ve left you with a bank of inspiration with these festive ideas for plant-based dieters. Have you got any top tips for vegans at Christmas to share? Whether it’s photos, ideas or topics for debate, we’d love to hear them. Just drop a comment below.